This post is sponsored by Enterprise Car Share. Thanks for supporting Baby Meets City! I look forward to many things about fall, and a day out of the city for pumpkin picking and taking in nature's changing colors is at the top of the list. 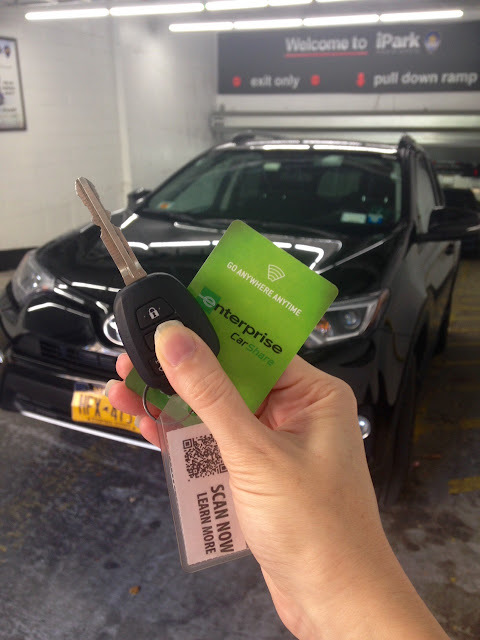 And while we do own a car, it's quite old and not exactly reliable for longer drives, so I was more than happy to learn about an easy replacement for the day: Enterprise's new Car Share program, which is available here in NYC and other cities around the country (including my hometown of Charleston, SC)! The process for using Car Share is quick and easy. After becoming a member online (you'll need to submit a photo & your driver's license), you'll then receive a card in the mail with a unique member ID number. Download the Car Share app to scan available cars in your zip code, and book using the app -- it only takes a few moments! When you arrive at a garage to pick up your car, as I did, just swipe your membership card over a sticker on the drivers' side windshield. The door will unlock and your keys will be inside. Vehicles are parked in designated spots all around the city, giving you 24/7 access. Should you need a car at 3am, you can find one! And reservations can be as short as 1 hour or up to 7 days. Enterprise Car Share is determined to make the ability to enjoy a day out of the city or a quick trip to the grocery store as easy as possible. What a gorgeous fall day, and it was made SO much easier by the use of Enterprise Car Share. And guess what? Exciting news. Enterprise would like to offer Baby Meets City readers a special promo. With this link, you can sign up for the Car Share program for $0, get your first year membership for $0 and receive $20 in driving credits. And remember, you don't have to save Car Share for roaming around the countryside. It's great for grabbing groceries (we love the parking lot at Fairway on 125th Street! ), a cool furniture find on Craigslist or picking up a friend from the airport. Disclosure: I was compensated for this review. All opinions, as always, are my own.